I first became acquainted with the Adagio con Variazioni by Respighi when I heard a really fine performance given by Mischa Maisky. It was the version with orchestral accompaniment, and it was on a CD together with other short works for cello and orchestra. I had never heard this work before and was not aware of its existence, which made the surprise of discovering this work even greater. The piece and the performance were mesmerizing, and its theme, beautiful and haunting, kept playing in my head for months! I decided to learn the work and have performed it several times with piano accompaniment. After each performance I received numerous comments from the members of the public about how much they enjoyed listening to this piece which was also unknown to them. 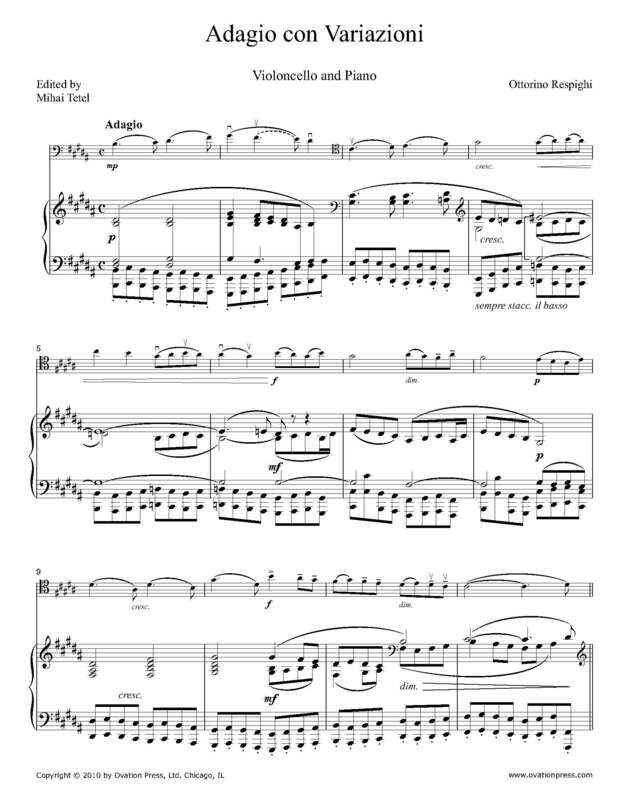 I realized time and again that this work is one of the best kept secrets in the cello repertoire, and deserves to be learned and performed by any cellist who is looking to expand his or her repertoire. The orchestra (or piano) is an equal partner to the cello in this rhapsodic work. I highly recommend this masterpiece to any advanced student or professional cellist. There are very few pieces in the cello repertoire which can match the beauty of this work. Click on the video below to watch Mischa Maisky perform Respighi's Adagio con Variazioni with orchestra.